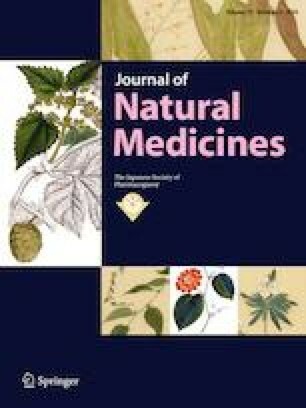 Two new compounds, namely 5-hydroxy-7-methoxy-6-methylchromone (1), and sesquiterpene X (6), together with 21 known compounds were isolated from the twigs and leaves of Cephalotaxus fortunei Hook. f. The structures of 1–23 were elucidated on the basis of spectroscopic analysis (1D/2D NMR, HR-ESI–MS and IR) and comparison with literature. The absolute configuration of compound 6 was determined by means of electronic circular dichroism calculation. The in vitro anti-inflammatory activities of all compounds were assayed in RAW 264.7 cells by assessing lipopolysaccharide-induced nitric oxide production. Compounds 1 and 6 exhibited weak effects with percentage inhibitions of 24% and 35.60%, respectively. In addition, compounds 4, 9, and 14 have the potential to be developed as therapeutic agents for inflammatory diseases because of their significant anti-inflammatory activities and high content in C. fortunei. The online version of this article ( https://doi.org/10.1007/s11418-019-01308-5) contains supplementary material, which is available to authorized users. This work was supported by the young and middle-aged teachers’ career development support plan of Shenyang Pharmaceutical University (2017); Laboratory for Marine Drugs and Bioproducts of Qingdao National Laboratory for Marine Science and Technology (LMDBKF201701).